Handmade labels add a special touch to any gift or handmade creation you might sell on Etsy! Today we have a bunch of beautiful handmade labels for you to stick on everything you make. These were created by the talented designer, Cathe Holden. I’m a huge fan of hers so I’m thrilled to share these free printables designed just for all my handmade lovin’ readers! I added a few to some of my lavender sachets…aren’t they cute?! I love the variety of colors and I know that this sweet little handmade sticker will let everyone know that these were made with care the moment they see them. I’m going to stick them on EVERYTHING! WorldLabel.com is a manufacturer of an amazing selection of labels and they helped make this set of handmade printables available to you today. They have a label for everything…check it out. 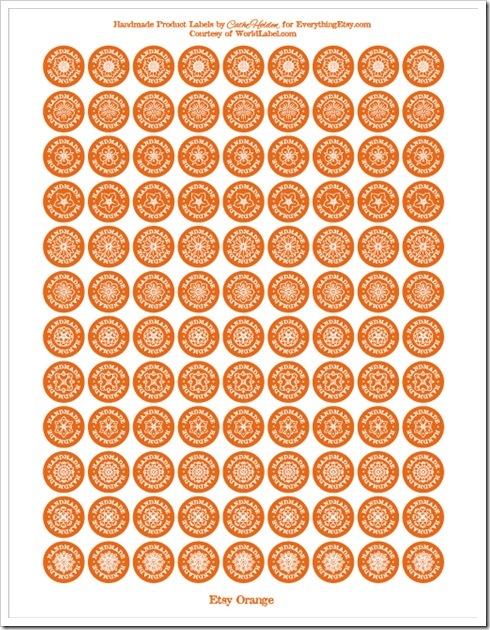 This is a great time of year to print these pretty little stickers and have them ready to top off your latest project. Download links below for this set of colorful handmade labels! 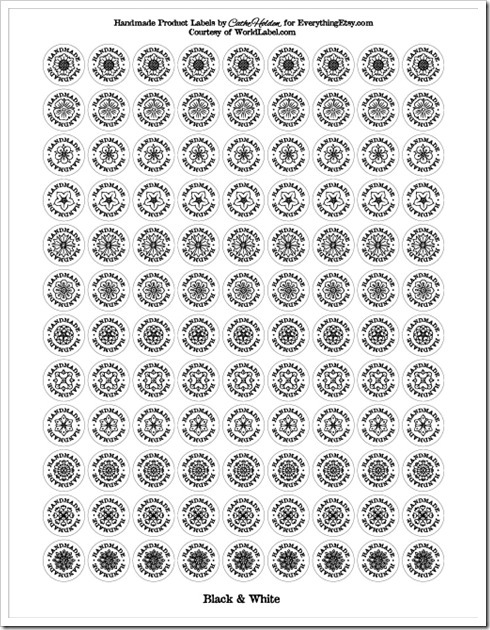 Download links below for this classy set of Black & White labels! We used Worldlabel.com size .75″ round for these. These designs are for your personal use and can’t be sold. You can find more of Cathe Holden’s designs here & here. 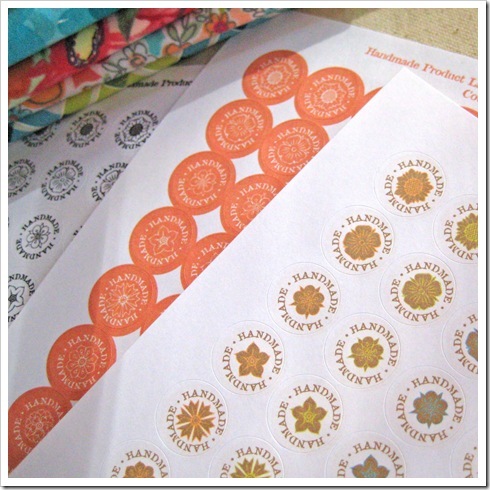 Download links below for these labels in a beautiful Etsy Orange! To download these PDF files, right-click (ctrl-click on Mac) the links below and choose “Save target as” or “Save link as”. (Exact wording depends on your web browser). *There was a giveaway with the original post that has ended. All winners will be notified by email and have 7 days to respond. Enjoy these awesome handmade labels! I’d make labels for my homemade christmas gifts. I subscribe to Everything Etsy in my reader! I can always use interesting labels to add a little info the packaging for my block prints (i have them on consignment at couple local shops, so i’m not there to tell folks about ’em myself). And it looks like there will be lots of canned-goods-as-presents this season – bet they’d come in handy there, too! These are so nice would love to add them to my handmades for giving. I ‘like’d World Label on Facebook. I would use them for my paper crafting! I like World Label on Facebook. I would make labels for my Christmas goodies. Hi Kim, I’m going to print them up on fabric so I can sew them on the things I make. I would use them to put labels on the soap I sell! I would def get the round ones to use on crafts and packaging! I also need some lables to make some for Christmas card and as gift tags for cookie trays we make. I would like these for my hats and baking gifts! Thanks! These are awesome!! I would stick them on everything too! Thanks for the chance! I am already a follower on twitter and I already am signed up for newsletters. Thanks! I’d love to have some labels for my handmade gifts!! I would use the stickers for Thank You labels on my Etsy packages! I subscribe to your e-mails! 🙂 I really want to win this! I would use the labels on all of my product packaging. I already own some world labels and use them all the time! I’m following world label on Facebook. Following World Label on Facebook. I would use the labels for my shop! like World Label on fb- Garilyn S.
like EE on fb- Garilyn S.
shared on fb- Garilyn S.
My x-mas presents would have pretty labels! I would put one in every package I send out. 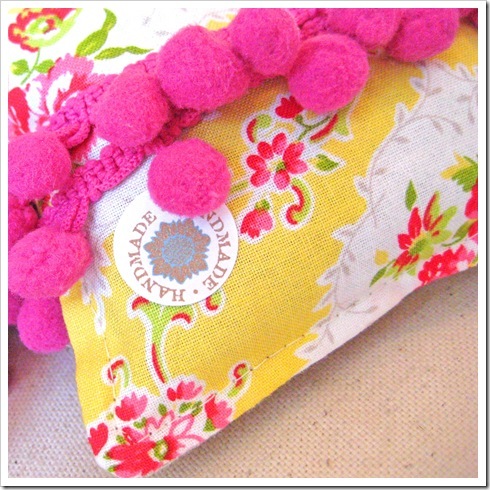 I’d use them on the items I sew for my daughters and it could motivate me to make some handmade gifts this year again! I would make personalized Christmas gift tags… YIPPEE!! Thank you for the chance to win! I would make handmade labels for my handmade Christmas gifts! 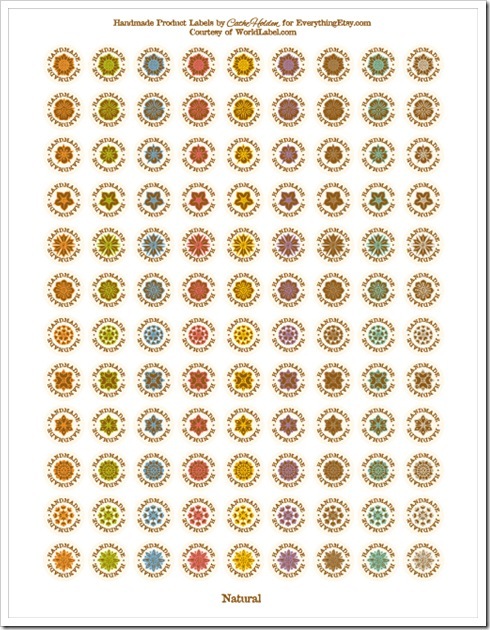 I had no idea that one could just order the little round stickers to print on your home computer. Thanks for sharing this info! I’d slap a sticker on everything I made! I liked World Label on facebook. I follow Everything Etsy in Reader. Oh I love labels…I would probably use them for tags on packages and presents!! I liked World Label on facebook! I also like EE on facebook! These labels are adorable! I make ALL my christmas gifts and cards…so these cute little numbers would add just the perfect touch to my homemade delights! I’d make thank you for your purchase stickers for my items. I’d use the labels for handmade gifts! Just came from Cathe’s site. 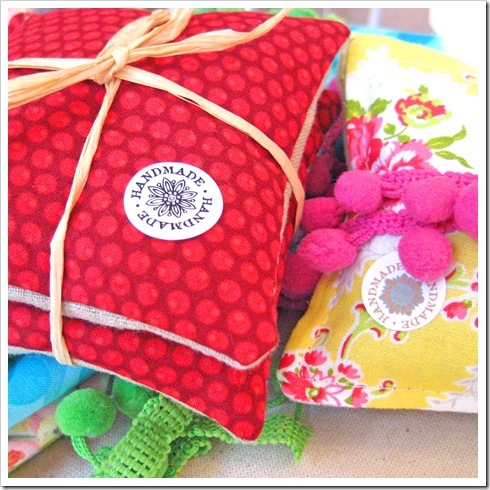 Would love to win some of these for my hand made goodies! I would love to use the labels for photo cards and cloth items that I make! I love WorldLabel! I make labels for our home industry products. 100 free ones would be a blessing!! I follow EverythingEtsy through Google Reader. Thank you for the labels! I’d love to be able to make stickers with them. I would place “Handmade” labels on the jewelry I create. Who can’t use some labels?!!! I would use them for all my handmade, for my baked goods, my scrapbooking, etc. Many thanks for a great giveaway. I would love some new labels for the bizillion drawers and boxes that need labeling in my craft area that I am reorganizing! I use labels all the time! I’d love to win some, too. Thanks for the chance. I subscribed. Wonder why I’d never found you before this. I like World Labels on Facebook, too. I would use the labels on my handmade goodies both my shop and for my family and friends! I follow EE via Google Reader! I liked you and World Labels on Facebook, and here’s my comment! I love doing mail art and these labels would be awesome for that! I would make some of the colored ones and the black and white ones that I could color myself. What a generous giveaway. I am always labelling things…. like Halloween and Valentine presents for all the kids at school, and Chirstmas baking that we share with neighbours and friends. I would use them for my etsy packaging! I would use these labels for the homemade Christmas gifts I plan to make this year! I like World Label on Facebook! 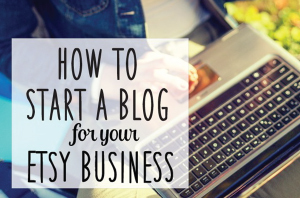 I subscribe to Everything Etsy, via Google Reader! I like Everything Etsy on Facebook! I tweeted about this giveaway, on Twitter, by retweeting your tweet about it! I am sure that a label would go on just about everything I do. I would print my new address! I love World Labels for my canning but I’d love to have these little labels for all my handmade gifts this Christmas! I would love these for my brand new soap business! I liked World Labels on Facebook! 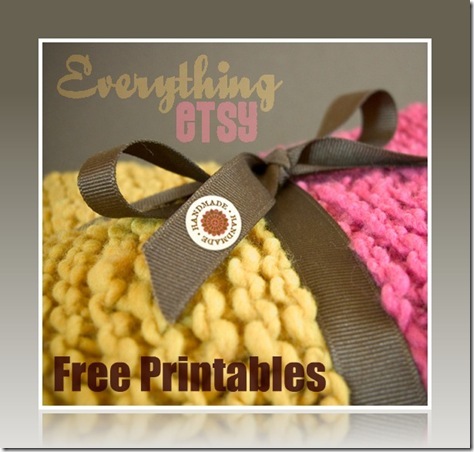 I follow Everything Etsy on Facebook and the newsletter!! I love making labels…hope I win! I’d make handmade holiday labels to stick on all the projects I am hoping to get done! I would use the darling labels to identify all the handmade things at our church fair. Thank you so much! Just read all about your journey…all I can say is I’m impressed! Follow the EverythingEtsy by facebook. And like the wordlabel.com too. I would use labels to enhance my branding. Etsy has made me SO conscious of the importance of being ‘me’, not a faceless mass production victim. Labels are a small but vital way to make you special. I’d use the labels for my collage art, mail art, homemade gifts, gift tags, scrapbooking — everything!!! I follow WorldLabel on fb. There are so many cute printables on the web, I’d use the labels to print off images that I can use to scrapbook with. If I won, I would use the printables and help spread the word about buying handmade! following World Label on FB! following everything etsy on twitter! I would label my whole house….grin. I have so many cute labels saved. I would print out some and stick them on my handmade treats for Christmas! I would use the labels for my felted, sewn, and painted goodies :). I’m following on Facebook now too! Now I’m a subscriber here too! I’d add a sticker to my homemade jams, jellies and canned goods, as well as the gifts I make for my co-workers at Christmas. I would put them on my christmas gifts for this year. Making a handmade gift is more personalized. I would use the labels for my hand crocheted Christmas presents. They are so cool. Thanx for this opportunity to win. I will use them for my etsy shop packages & for my handmade christmas gifts. And since they are a lot I will share some in a blog giveaway latter. I already subscribed. And follow you on twitter. https://twitter.com/#!/7Janeth7 And liked wordlabel.com on facebook. I would make a label with my brand name on it for all of my hand made items. The labels from Worldlabel.com are so simple yet so perfect. 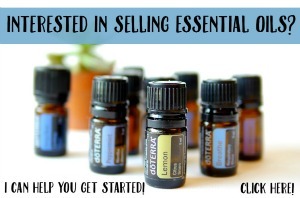 I am now following Everything Etsy on Facebook. Hmmm-I can think of a million uses for these cuties! All my etsy items! I would love those sticker labels! I will use them in all my handmade crafts because I just usually hand write the words “Handmade by Mayje”. I just spread a word by posting and linking your give-away on my blog. I would love to use these on handmade xmas gifts! I would love some labels. I make a variety of small gifts for my family and friends. (Some magnets, fancy pencils, Christmas ornaments and other items) I would love to have a lovely way to designate them as handmade. I’d use them on the Christmas gifts I’ve made (or am still making) this year! I put you in a blog post! I’d use the labels for my homemade caramels I make each winter. I would make Handmade labels for all of my new products I’ll have at our Spring Maker’s Fair! I “like” WorldLabel on FB! I would put them on all my gifts for xmas. I have opted to only give handmade things this year! I would stick them on my boxes for items I am shipping on ebay. I already follow EE on Facebook! I would give them to my sister for her Etsy shop! So cute!